For more than 15 years the kraft paper and paper sack industry has run studies to measure its environmental impact, providing the basis for continuous improvement. Today more than 50% of the total energy consumption of the European pulp and paper industry comes from biomass fuels which are CO2 neutral. The carbon intensity of 1 tonne of average European kraft paper – which accounts for 60% of the carbon footprint of a paper sack – was optimised by 20%. In the further course from cradle to gate, the overall carbon intensity of one individual paper sack has improved by 22%, partly due to lightweighting efforts. Extending the analysis to include additional aspects would give an even more complete picture of the carbon footprint of European paper sacks. Taking into account end-of-life emissions and any benefits arising from emissions avoided due to recovery and waste management activities reduces the carbon footprint per average European paper sack to 85 gCO2 e (instead of 92 gCO2 e). It is a well-known fact that forests sequester and store carbon. 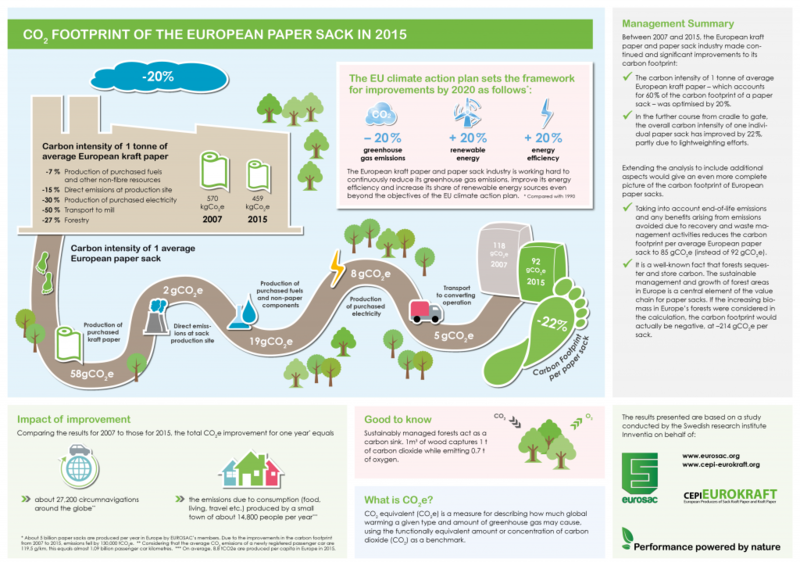 The sustainable management and growth of forest areas in Europe is a central element of the value chain for paper sacks. If the increasing biomass in Europe’s forests were considered in the calculation, the carbon footprint would actually be negative, at –214 gCO2 e per sack.